Sources: Most are raised in Wisconsin and Minnesota, although some are still harvested from rivers here in Wisconsin. All Year. LG and XL usually only on-hand from late August through November. One of the "toughest" baitfish we handle. The small Muskie size, often referred to as "Decoys" or "Odds" are sometimes used as decoys for spearing, and as "cut-bait" for catfish. 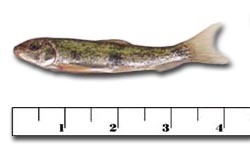 Large (Northern Pike) 4 to 7"
Small Musky 8 to 10"
Medium Musky 11 to 13"
Large Musky 14 to 16"
How do we ship live bait?